The load from earth pressure and surcharge are computed in the frame "Load analysis". The stiffness of the shaft has a major influence on the earth pressure. Rigid structure does not allow deformation, so the earth pressure is much higher than on the flexible shaft. Load from earth pressure and surface surcharge acts as uniform load on the whole diameter. This load causes structure stress only by normal force - bending moment on the shaft is theoretically equal to zero. For modelling of real behavior of the shaft, the program introduces the Reduction coefficient in compliance to the standards DIN V 4034-1 or СНиП II-94-80. Recommended value of reduction coefficient is 25 %. Load from local surcharge is considered as shown on the next picture. This load is not modified by reduction coefficient. If the walers are input the program computes the load on each of them. The load depends on the axial distance between walers as shown on the picture. 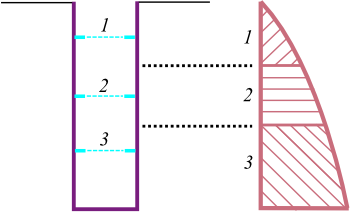 If no walers are input, the program computes load on unit depth (1 m, 1 ft). If load is calculated, then program determines the distribution of internal forces on structure of the shaft. Berezantzev, V. G.: Earth pressure on the cylindrical retaining walls, Brussels conference on Earth pressure problems, 1958. ČSN 73 0037: Zemní tlak na stavební konstrukce, 1990. DIN 4085: Berechnung des Erddrucks, 1987. Exner, K.: Hloubení jam, VŠB v Ostravě, 1986. 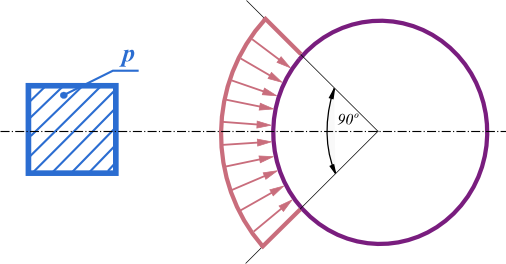 Cheng, Y. M.; Hu, Y. Y.: Active earth pressure on circular shaft lining obtained by simplified slip line solution with general tangential stress coefficient. Chinese Journal of Geotechnical Engineering, 27 (1), 110-115, 2005. Link, H.; Lutgendorf, H.; Stoss, K.: Richtlinien zur Berechnung von Schachtauskleidungen in nicht standfestem Gebirge, 1976. Sedláček, M.: Zatížení kruhových šachet prostorovým zemním tlakem. Příspěvek ke konferenci Zakládání staveb, 2014. Snášelová, K.: Hloubení a vyztužování jam v extrémních podmínkách, ODIS VTEI pro uhelný průmysl, 1987. Tobar, T.; Meguid, M.: Distribution of active earth pressure on vertical shafts, Geo Halifax, 2009. Valencia, T. T.: An experimental study of the earth pressure distribution on cylindrical shafts, McGill University, Montreal, 2009. Walz, B.; Pulsfort, M.: Raumliche Erddruck auf Schachtbauwerke in Abhangigkeit von der Wandverformung, Bergische Universitat Wuppertal, 1999.